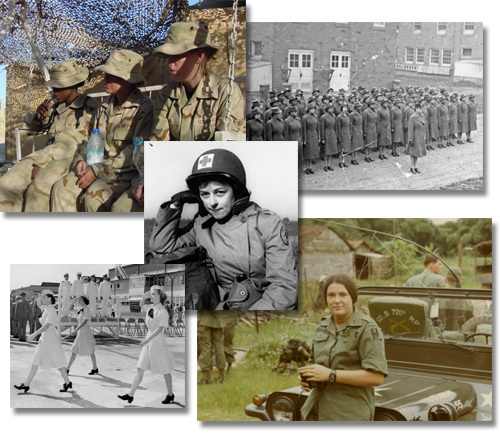 The Betty H. Carter Women Veterans Historical Project (WVHP), established at The University of North Carolina at Greensboro (UNCG) in 1998, documents the contributions of women in the military and related service organizations since World War I. The WVHP includes a wide range of source material including photographs, letters, diaries, scrapbooks, oral histories, military patches and insignia, uniforms, and posters, as well as published works. Through active acquisition and educational outreach, the WVHP continues to expand its research collection to explore the cultural, social, and military changes in American society that have been fueled by the gender integration of the armed forces. The WVHP’s strengths are oral histories and materials from veterans of World War II, but it also includes the stories and materials of women who served in World War I, the Korean War, the Vietnam War, The Cold War, Desert Storm, the Gulf Wars, and the War on Terror. The WVHP currently holds almost 650 collections which include over 425 oral histories. The collections chiefly document women military veterans, but they also chronicle the contributions of workers in related service organizations such as the Red Cross, special services, and civilians in service. Our current focus is collecting oral histories of UNCG student veterans as well as women in the Greensboro area.